Last week we tried out the San Francisco Sour Dough recipe from Peter Reinhart’s latest book ‘Artisan breads every day’. We used our home made local Amsterdam rye sourdough culture because we believe our bread thrives on it (rather then buying and shipping a sourdough culture from halfway across the globe that maybe would not feel at home here). We made it during the weekend because to make these breads you have to have time and patience and planning skills! First there is the starter stage , 8 hours of fermenting at room temperature, then 10 hours in the fridge. After that making the full dough with the starter: 2x stretch&fold with a 10 minute interval and 2 hours of fermentation at room temperature. Then it’s back to the fridge for 15 hours! Take from the fridge and let it get up to room temperature again, 2 hours. Divide and shape, proof 1-1,5 hours. And finally! the baking itself, 44 minutes in our Rofco bread oven. First result: see picture. We think it’s worth it! All these stages are necessary to build up the sourness in the dough. 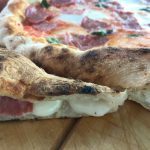 As the yeast is normally more active in sourdough than the bacteria which produces the sourness, in the form of lactic-acids, you need to stretch time to give the bacteria more time to do there job. Using the refrigerator is an excellent way to stretch time without the problem of the yeast eating up all the ‘food’ in the dough and ruining your gluten chains which makes the dough gloopy and soft. The cold of the fridge puts the yeast into a dormant state and gives more time to the bacteria to make the lactic-acids. When the dough went in the oven we were not sure at all about the result. It looked like something between a pancake and a deflated balloon. The dough wasn’t easy to handle, it looked flabby. But the oven spring was enormous, as you can see by the final result in the picture. 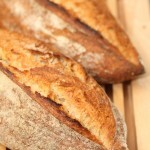 The bread has a pleasant light sour smell, crusty crust and full bread flavour. This first attempt has room for improvement: the crust was a little too dark and the shaping is a challenge. 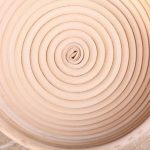 We also adapted the original recipe, used a little less water and added an extra stretch and fold and bench-rest during shaping. However we still need to perfect the recipe because the dough is still very soft and sloppy and hard to work with. The margin of error during shaping is very small, and sometimes the breads turn out as flat kind of pancakes which erupt in the center. But the taste is still very good! I am using your recipe following the instructions as exactly as possible. I have now arrived at the stretch and fold stage and the dough is very wet and sticky and very hard to handle. It is now in the fridge. I am a bit worried that tomorrow I will not be able to shape it and it will end up a flat splodge. Any suggestions? This dough is supposed to be wet and sticky, and most people need at least a few turns to get used to the sticky. Next to this it is important you use the right bread flour with a protein content of around 12 to 13%, for a good gluten structure and a strong dough. 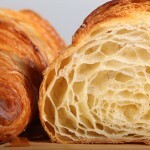 If you think your dough is very slack you can try and do a few extra stretch and folds. 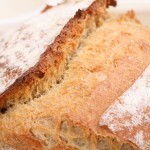 Be generous with flour in basket and on bread when putting it in the basket, you can always brush off excess flour. 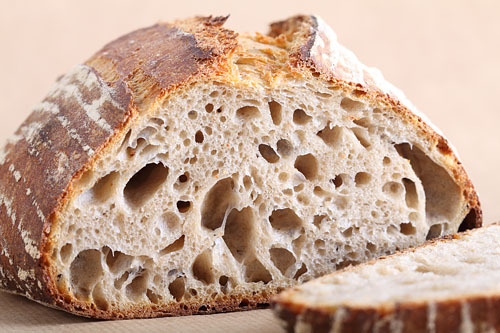 Can you please advise me how to create loads of holes in your SD bread? The holes in my SD bread are not big, but there are quite a few of them. My bread seems to have a tight even crumb. I like the great big holes and plenty of them. 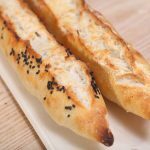 Please help me with this, as the main reason why I am learning to make SD bread is its texture. Plus: Try not to work too much flour in your dough from your bench, while handling it. Some people keep adding flour because the dough is sticky, this way altering the dough. You have to get used to the sticky and the handling of it. We do not fully understand your question…you say your loaf is burned but you have not started it yet? Good to hear. It always takes at least a few baking rounds to get a recipe right for your conditions but it seems you are very much on the right track already. The Rofco oven has 3 floors of brick, you can bake 6 breads in one go. The oven takes about 2 hours to heat up. The first hour it heats continuous and the second hour the heat spreads evenly through the bricks and the oven only heats for a minute every 5 minutes or so. It is a Belgium handmade oven made by a small family owned company for over 20 years (see www.rofco.be for more information). The mixer is of German making. It’s a Häussler Alpha mixer with a 6 kilo dough capacity and removable dough hook and removable bowl. Yes, it is worth it. Time = Taste! Good luck with the starter. Don’t be discouraged if at first your starter isn’t ‘living up’ to it’s promise. Just try again and you will see it will turn out OK! That sounds like a lot of time to make bread. I hope it is going to be worth it. I am just begining my first starter. Thanks for sharing.